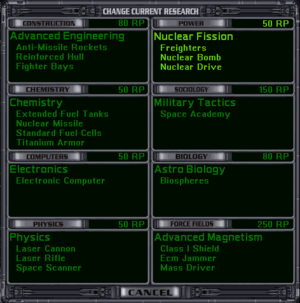 The Sociology techs appear in the 2nd row of the right column in the Research menu. Sociology has by far the most singleton techs of all the subjects, in fact there is only one level that contains more than 1 tech. None. You have to research all the Sociology techs if the game starts at Pre-Warp. Building that trains warship crews. Any ship built by a colony with a Space Academy starts out one experience level higher. Any ship stationed in a system with a Space Academy gains 1 additional point of experience each turn per Space Academy in that system. Experience increases a ship's beam attack, beam defense and missile evasion. These should only be built on planets that mostly produce combat ships. If that's not what they're building, you're not getting any benefit from the 2 BC in maintenance every turn. The best planets are naturally those that can provide the most PPs. Note: Ships normally gain 1 experience per turn. The in-game tooltip states that the Space Academy bonus is 2 experience per turn, which is incorrect. The manual states that experience affects boarding, which is also incorrect. Achievement that makes your diplomatics more persuasive in dealings with other empires. Building that assimilates conquered populations at the rate of 1 per 2 turns, regardless of government. The adjustment for a Charismatic or Repulsive race is applied to this base rate. This building also removes the 20% morale penalty from multi-racial colonies, and it halves the unrest of the assimilated populations, decreasing the chance of revolt. Best choice for non-Creatives: Alien Management Center. Diplomacy is usually forbidden in online games; and is unlikely to be much use in single-player games because Repulsive is the most common negative pick in race design. Building that increases a colony's non-special income (i.e. excluding gold and gem deposits) by +100%. Cumulative with Spaceport: Spaceport + Stock Exchange = 150% increase, i.e. 2.5 x the base value. A Stock Exchange is profitable on "normal" planets if the population (excluding Natives and Androids) is at least 4; on high-maintenance planets (Toxic, Radiated, Desert) the minimum is 5. Realistically they're only worthwhile with 8 as a bare minimum, depending on your internal rate of return; same with Spaceports. Build Stock Exchanges wherever profitable as soon as you research the tech, even if you're stockpiling production for something else. Building that increases a colony's food production by +1 per farmer (including Natives), its industrial production by +1 per worker and its research by +1 per scientist. Rather expensive since the standard costs for a +1 industrial or research building are 60 PP with maintenance 1 BC. Most valuable to Uncreatives who may not get the opportunity to research Research Lab and /or Automated Factory (and if really unlucky may also miss out on Supercomputer and Robo-Miners). Upgrades your government to its advanced form. Possibly most valuable to Dictatorships, who get morale bonuses and double command points; Unification is probably the other significant gainer, as the time it takes to assimilate conquered colonists comes down to an almost reasonable level. See Race design options for details. Of no practical use since this subject contains no warship techs. This page was last edited on 2 August 2015, at 05:40. This page has been accessed 28,057 times.